The Vaccine Program will provide you money if you have suffered from this vaccine injury. Vaccine attorney Leah Durant knows the process and can represent you free of charge. Once accepted into the vaccine injury compensation program, all attorneys’ fees and costs related to your vaccine injury claim are paid by the Vaccine Injury Compensation Program. The Vaccine Injury Table is the heart of the National Vaccine Injury Compensation Program, established by the National Vaccine Injury Act of 1988. All vaccine cases are filed in the United States Court of Federal Claims and decided by the Office of Special Masters. Individuals who suffer vaccine injuries according to criteria listed in the Vaccine Injury Table must establish a case for monetary awards under the vaccine program that the Department of Health and Human Services may rebut by proving that the injury was caused by “factors unrelated” to the vaccine. If an individual filing a vaccine injury claim does not meet the criteria outlined in the Vaccine Injury Table, he or she may still receive compensation by proving that the injury was actually caused by a vaccine. Brachial neuritis is specifically listed on the Vaccine Injury Table for tetanus toxoid, a vaccine that may be administered alone, or with other vaccines such as the Diptheria-Tetanus-acellular Pertussis (DTP, or DTaP, or Tdap) vaccine. The Vaccine Injury Table makes it easier for some people to get compensation. The Vaccine Table lists and explains injuries that are presumed to be caused by vaccines. It also lists time periods in which the first symptom of these conditions must occur after receiving the vaccine. If the first symptom of these conditions occurs within the listed time periods, it is presumed that the vaccine was the cause of the injury or condition unless another cause is found. According to the Vaccine Injury Table, the time frame for the onset for brachial neuritis after having received a tetanus vaccine is 2-28 days. Brachial neuritis. (i) This term is defined as dysfunction limited to the upper extremity nerve plexus (i.e., its trunks, divisions, or cords) without involvement of other peripheral (e.g., nerve roots or a single peripheral nerve) or central (e.g., spinal cord) nervous system structures. A deep, steady, often severe aching pain in the shoulder and upper arm usually heralds onset of the condition. The pain is followed in days or weeks by weakness and atrophy in upper extremity muscle groups. Sensory loss may accompany the motor deficits, but is generally a less notable clinical feature. The neuritis, or plexopathy, may be present on the same side as or the opposite side of the injection; it is sometimes bilateral, affecting both upper extremities. While the Department of Health and Human Services acknowledges that brachial neuritis can be presumptively caused by tetanus vaccine, other vaccines may also cause brachial neuritis. A review of the Court of Federal Claims website indicates that the Department has settled many cases where brachial neuritis is claimed after other vaccines such as flu vaccine, hepatitis B vaccine, and MMR vaccine. If you have suffered brachial neuritis after receiving any vaccine, you may well be entitled to recover a monetary award. Vaccine attorney Leah Durant specializes in representing clients who suffer from brachial neuritis injuries following receipt of a vaccine. 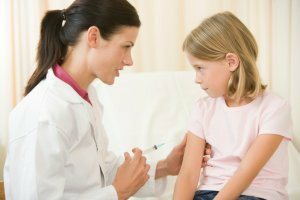 If you or someone you love has suffered a vaccine injury, contact the vaccine attorney Leah Durant at the Law Offices of Leah Durant. We handle vaccine injury cases nationwide, at no cost to you. Our vaccine attorney has years of experience in Federal litigation, including working at the United States Department of Justice. Vaccine proceedings are complicated both medically and procedurally. The Vaccine Court at the Court of Federal Claims uses unique procedural rules to adjudicate vaccine injury claims. Vaccine attorney Leah Durant can help those injured by vaccines gain the best results. To request additional information about brachial neuritis, call The Law Offices of Leah V. Durant, PLLC today at 202-775-9200 or by emailing info@vaccinelaw.com.